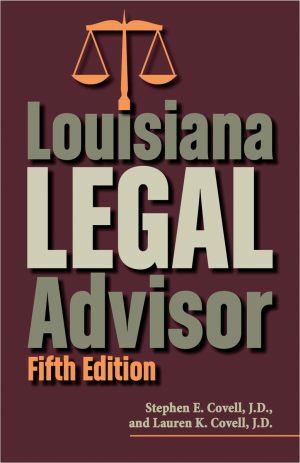 Designed to allow residents to navigate a unique legal system, this is the only book on Louisiana law written for laymen. Frequently asked questions and a glossary of terms are also included. • how to write a will, create a marriage contract, change your name, form a corporation, protect assets, recover a debt, recover a rent deposit, use the Lemon Law, fight for custody, settle a small estate, deal with a bankruptcy, protect yourself in a divorce, and more. Stephen E. Covell, J. D., and Lauren K. Covell, J. D., have more than fifty years of combined experience helping people with their legal problems. They both graduated from Louisiana State University Law School and practice law together in Baton Rouge, Louisiana. By Stephen E. Covell, J. D., and Lauren K. Covell, J.D. I think reading this book last year convinced me to go to law school. I'm just now finishing my first year at LSU.